Those were three of the first words Robert Galinsky heard when he arrived in Los Angeles. They were coming from the mouth of the hotel clerk as he was checking in. Galinsky explained that he had a fully realized solo play, The Bench, ready for its West Coast debut at the Hudson Guild Theatre. “That’s what everyone said would happen,” Galinsky says, noting that L.A. is teeming with the creative process-emphasis on the word process. He’s hoping that his new solo play about the issue of homelessness, a social ill southern California simply doesn’t know what to do with, will have a more immediate impact in Los Angeles than a random Starbucks-scribbled screenplay. It was the perfect time, he says, to come across these men. Galinsky was resisting the middle-class trajectory he felt life was pushing him towards, and ultimately left school to join a theatre company. That’s where The Bench began, and it was originally a traditional production staged with a full cast of actors. Galinsky has retained that original structure, preserving the real time dialogue between characters for the one-man version. He’s been directed by friend Jay O. Sanders, an extremely busy actor who never stops working on New York’s stages. Sanders holds the record for appearing in more Shakespeare in the Park productions there than anyone else, and Galinsky credits Sanders with making him approach the material in a simpler, more direct way, which he at first found intimidating. Of course, what could be scarier than trying to enlighten a Los Angeles audience about homelessness? This is a condition that has become endemic here, with no zip code unaffected by the problem. The L.A. Times reported in February that the city’s homelessness rate has risen 75% in the last six years. In 2017 the N.Y. Times estimated that a quarter of the nation’s homeless population is based in California. The problem feels intractable, and I ask Galinsky what he thinks the solution is. He believes that the focus should be on two areas: putting people in homes and attending to their mental health. “You can get them tampons and towels, but if they’re just going back on the streets, then we’re not solving the problem, just continuing to manage it.” As far as mental health is concerned, he acknowledges that institutionalization and medication may be more robust in the future-though he hastens to stress that people should not be forced into anything against their will. Galinsky insists that any solution can only be successful if it puts the focus on the individual. He notes that insurance companies, for instance, routinely assess individuals to determine their various conditions and economic capacities. Attention to the individual is what makes the problem feel overwhelming, Galinski says, but he’s convinced it’s the only way of getting this done. 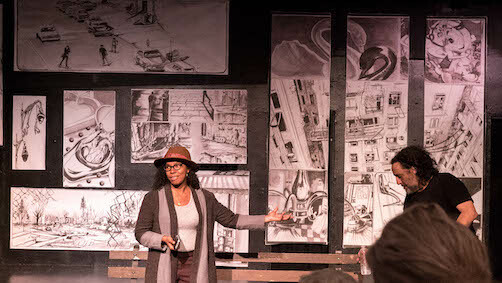 The production sells a graphic novel by artist Daphne Arthur based on the play, and proceeds benefit some of the charitable organizations The Bench has partnered with like the Downtown Women’s Center and the Research Foundation to Cure AIDS. Panels from the book also comprise much of the set, and Galinsky gives free tickets to outreach workers. There’s also a talkback after every performance and he routinely answers questions in character. “When I do that, it’s like there is a whole other level of emotion that [I] couldn’t show in the script,” he says, and it deepens his connection to the work for the next performance and the next audience. Of course, this is still L.A., and Galinsky’s hotel clerk won’t be surprised to learn that he hopes to turn The Bench into a film or TV show. He’s co-written scripts for both with B. Kim Taylor, and has meetings set up with Netflix and Amazon. In the meantime, he hopes to keep The Bench on the road, taking it to colleges and high schools. He’s lost track of those men he met three decades ago, but believes their story is as relevant today as it was back then. It’s ultimately a love story, he says. The Bench runs until November 9 at Hudson Theatres, 6539 Santa Monica Blvd in Los Angeles.